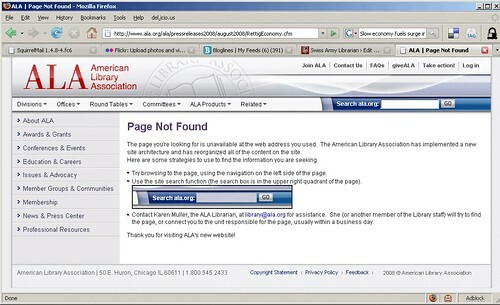 The American library Association just revamped it's website. Many links are still broken, so I've been seeing their new 404 page a lot. So here's my complaint - the nice little search box in the middle of the page isn't a functioning search box, it's just an image. Sure, the search box is at the top of the screen, but why not focus on customer service and make this 404 page more functional and user-friendly by putting it in both places? More whining about this on my website.